If you don't read social media or certain entertainment websites, you may have missed that Taylor Swift released a new single recently. (Depending on your social media and website reading habits, you may have missed that anything else at all has happened recently.) I was going to write a Mystery Theme quiz based on the lyrics, until I started thinking about her "list of names" and realized just how many people have such a list. Welcome to that quiz instead! As alluded to in the title and introduction of this quiz, in Taylor Swift's new song, "Look What You Made Me Do", she sings, "I've got a list of names, and yours is..." WHAT TWO FEATURES set apart the name of the song's addressee? TayTay isn't the only person with a list of names these days. Another recent example, which I keep seeing as a comparison in articles about the song, is THIS CHARACTER (first and last name, please). It seems odd to me, since based on the previous answer Swift's list is clearly written, while this character used to recite hers (in the books, it's called her "prayer", and she ends it with the words Valar morghulis), and I'm told—I could be wrong, I admit I don't watch the show—that she hasn't even been reciting it for the last several seasons. Then again, the answer to the previous question isn't even the only recent TV character to have a list of people to kill. In the first season of WHAT SHOW, released in November 2015, do two characters find a list of mostly crossed-out names in the Colorado hideout of a Sicherheitsdienst (SS intelligence) agent, with only "Trudy Walker" and "Lemuel Washington" remaining? Some people make their own lists, some torture their lists out of other people, and some just inherit their lists from their parents. The main character of WHAT TV SHOW spends the first season (2012-13) working his way through a list of villains compiled by his late father, Robert Queen? It's not until the end of a 2003 movie that we see its protagonist write a list of five names headed "Death List Five", even though we've already seen two of the names crossed out. WHAT NAME is written next to #5? If you want a pop (or at least adult alternative) musical precedent for Taylor's list, you need only listen to the 1998 Grammy winner for Song of the Year and Record of the Year. WHAT SINGER tells us that "Sunny came home with a list of names / She didn't believe in transcendence / 'It's time for a few small repairs', she said / Sunny came home with a vengeance"? Usually, you cross someone off a list of names because you've killed them—but not always! In a 1995 movie, Danny McGrath (an uncredited Steve Buscemi) crosses the name of WHAT TITLE CHARACTER off his "People to Kill" list when that character, back in school as an adult, calls Danny to apologize for having bullied him in high school? What 1984 TITLE CHARACTER also had a list of names? It wasn't a very long or interesting list. Actually, it was just the same name three times, taken from a phone book. And even then, he only succeeded in killing two of them. The plot of WHAT 1982 MOVIE hinges on two lists of names, "Friends of Carlotta" and "Enemies of Carlotta"? Private investigator Rigby Reardon, wearing costumes designed by Edith Head, finds them among the possessions of a murdered cheesemaker, and subsequently investigates with the help of many film noir clips from the 1940s. Three years earlier, it's back to musical lists, but this time a list of people who might be worth killing for profit, not revenge. Though they admittedly had a list of professions, not names, name the TWO CHARACTERS who, in 1979, sang about doing away with priests, lawyers, marines, tinkers, tailors, potters, butlers, and the unrhymeable locksmith? I rather enjoyed the 1963 movie The List of Adrian Messenger , in which the titular list is not a kill list at all: in fact, they are people who Messenger suspects have been murdered. We do see the (heavily disguised) killer cross a name off a list at the very start of the film, with Messenger's name right above it. Speaking of heavily disguised people: four handsome leading men of the era also make cameo appearances. 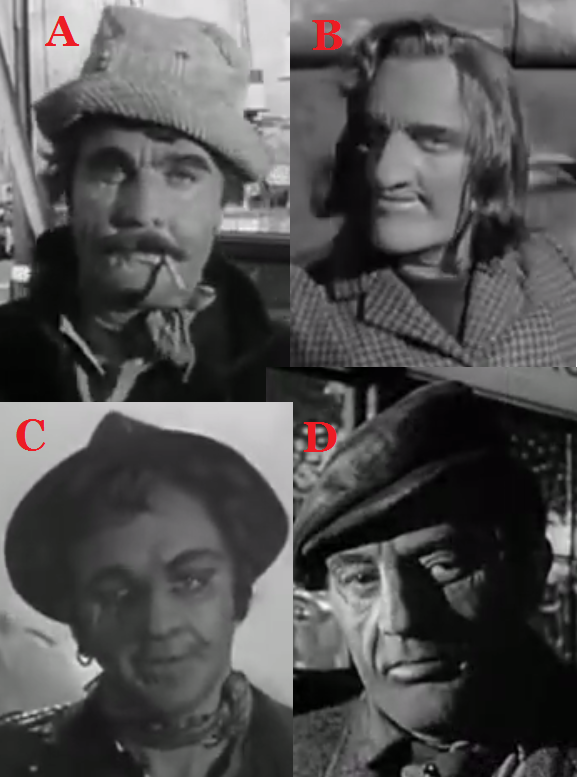 Identify ANY ONE OF THE FOUR, seen here before removing their makeup in the closing scenes of the movie. Ultimately, if we're talking about songs with lists of people to be killed, we can't leave out Gilbert and Sullivan's foundational 1885 contribution to the genre. In Act One of The Mikado , Ko-Ko rattles off a litany of people he'd rather do without in "As some day it may happen", more commonly referred to as "I've Got a Little List": autograph seekers, lady novelists, comedians, all the usual suspects. Ko-Ko knows whereof he speaks: he's a member of WHAT PROFESSION?